This is very interesting as well as challenge Missing Pieces Jigsaw Puzzle. In this Jigsaw Fun Picture Puzzle, four jigsaw pieces of image are taken and displayed on the right side of the picture. Your task is put all the four missing jigsaw pieces to its respective locations. 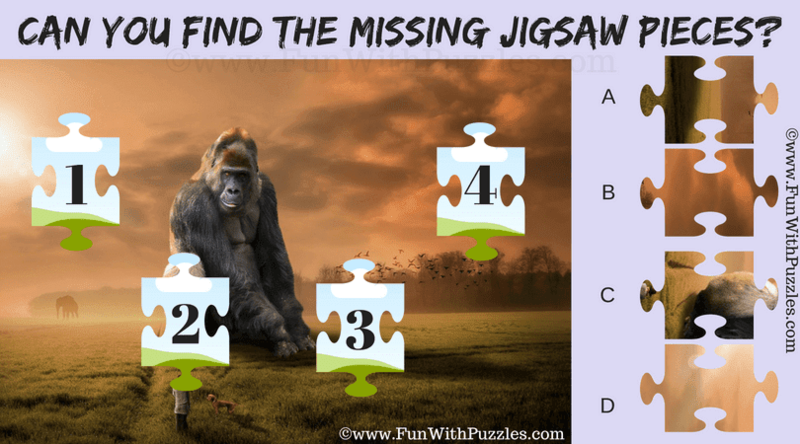 Lets see how much time you will take to solve this Missing Jigsaw Pieces Puzzle? Answer of this "Missing Pieces Jigsaw Puzzle", can be viewed by clicking on button. Please do give your best try before looking at the answer. The Answer is A3, B4, C2 and D1.